It is a very happy day when you collect a new boat, full of excitement at adventures ahead and wondering what stories you’ll find together. 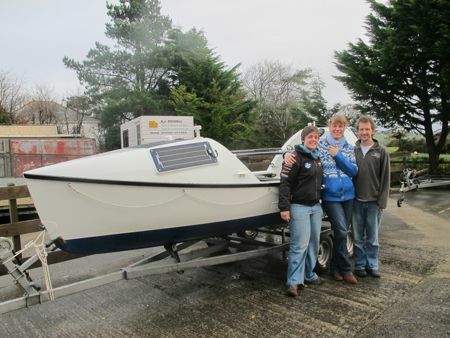 My new Project Manager Mel and I went down to Cornwall this week to pick up Happy Socks from Global Boatworks, driven by two of the drivers from local car sponsors Sturgess. The Land Rover couldn’t have been more perfect for surviving the floods and it was a real pleasure to snooze and chat while the miles whizzed by. Once again, Jamie has done a fantastic job – she looks gorgeous and it is great to see the modifications come to life. More on these next time. We hope to get her out for a paddle in a couple of weeks’ time. Woop, woop and wooop! Thanks to Colin and Arthur from Sturgess for all the driving. PS: Thanks to everyone who came to my talk at the RGS last week. It all seemed to go very well and started off a great weekend at Explore. For those planning an exped or looking for ideas, make sure you go next year. Emily and Jamie are good kids. 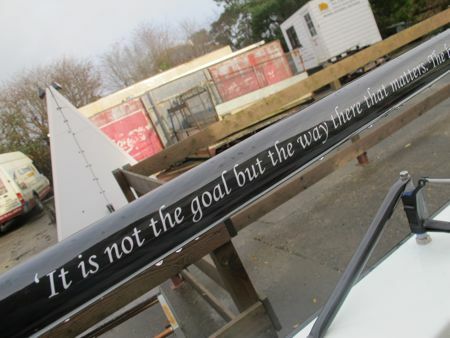 First learned about them and in turn YOU when I saw “Positive Outcomes” on the Ocean Rowing site. What a great design. She’s a looker isn’t she? Very cool. You’d approve too Barry – there is a WTP quote down one of the safety rails. ‘Rivers know there is no hurry’. More to come. I’am not sure how you celbrate Christmas .I would like to wish you and your crew the very best of the season. Thanks Barb – that is super kind. Christmas will be a family time for me – as I was away last year and will be next year too. Canada, I hope!